Dave Cabiness says Obama's mortgage plan tantamount to "printing money"
FORT MYERS, Florida (CNN) -- With eyes tearing, some stare off into space. Others sit quietly with an expressionless pain as they wait for the inevitable. Casey McNeer couldn't even speak her name when the judge called her case. When you are called before this court, it's the end of the line. You are about to lose your home. This is foreclosure court in Fort Myers, Florida. At this point in the legal process, all that's needed is a judge's signature. CNN was in court Friday to witness the process, which takes seconds. It's called the "rocket docket." On some days the court hears up to 1,000 cases. The national rate of foreclosure jumped by 79 percent between December 2006 and December 2007, according to RealtyTrac, a company that compiles data on home foreclosures. Foreclosures continued to climb in January, though at a slower pace than the month before. The number of filings was still 18 percent higher than it was in January 2008. Lee County, Florida, is one of the hardest-hit areas in the country and presents a microcosm of the national housing dilemma. With home prices down about 50 percent from their peak and unemployment now at 10 percent, the area is littered with "For Sale" and "Auction" signs. The courtroom is a collection of economic horror stories. Casey McNeer couldn't even speak her name when the judge called her case. 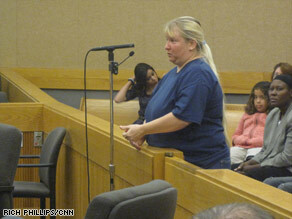 Her face red from crying, she wiped away tears as she told the judge her story. "My husband passed away and the debt just kept getting higher and higher," she said. "[My bank] told me my best option was to refinance, but they wouldn't do it," she said. Starnes asked, "So you acknowledge you're behind in the payments?" "You're not in the home and it needs to go into foreclosure?" the judge asked. That was all the judge needed to hand down his order. "I understand," she said. She now has 60 days to vacate her home. It's a short process. Currently, there are about 30,000 homes ready to be foreclosed upon in Lee County. Starnes is a retired judge who was asked to return to the bench to help move the cases faster. Sixty percent of the cases handled here involve homeowners who were speculators and out-of-towners. They don't bother showing up for the court hearing, so the process is quick, and many are handled in seconds. "This is about the most efficient way to do it," said Robert Hill, a plaintiff's attorney hired by a consortium of banks to handle foreclosures. But there is a reality to this process, and even some silver lining, he noted. "If you talk to the plaintiff's attorneys, they would say, 'Well look, some of the people are complaining, but actually they've been able to continue living in the house, without paying a mortgage, for a year,'" Starnes told CNN. "So the legal procedure may seem cold and impersonal, but it took long enough to carry it out....that some of the people benefited," he said. Friday's news wasn't bad for everyone. Patricia Valverde, a mortgage broker who had been laid off, thought she was about to lose her home to foreclosure. Valverde had an adjustable-rate mortgage on a house she paid $300,000 for. She watched her monthly payment jump from $1,700 to $2,250, while her property value fell to about $80,000. She was so upside-down on the house that no one would refinance her, she said. "I'm so happy with his ideas and everything. I think everything is going to change with him," she said of Obama. The president's Homeowner Affordability and Stability Plan will provide $75 billion to help millions of homeowners who are making a "good-faith effort" to keep up with their mortgage payments. But not everyone was impressed by the Obama plan. Dave Cabiness lost his home of 15 years. He stopped making his house payment in October 2007. He has a mortgage of $235,000, while his home is worth only $160,000. "My business decision is to take my lumps and start over," he told CNN. He said he has no confidence that the market will improve any time soon. "We have five years of inventory of foreclosed homes here. The values are still going to continue to go down," he said. And on the Obama plan, Cabiness said, "We're printing money. We're not even borrowing it. "So our dollar isn't even gonna be worth 10 cents." The "rocket docket" is particularly hard for Starnes. He told CNN that he previously spent years on the bench in a family court, where he was able to work on solutions. "You just have so much sympathy for the people going through it," he said. "There's not much opportunity for problem-solving at this point."